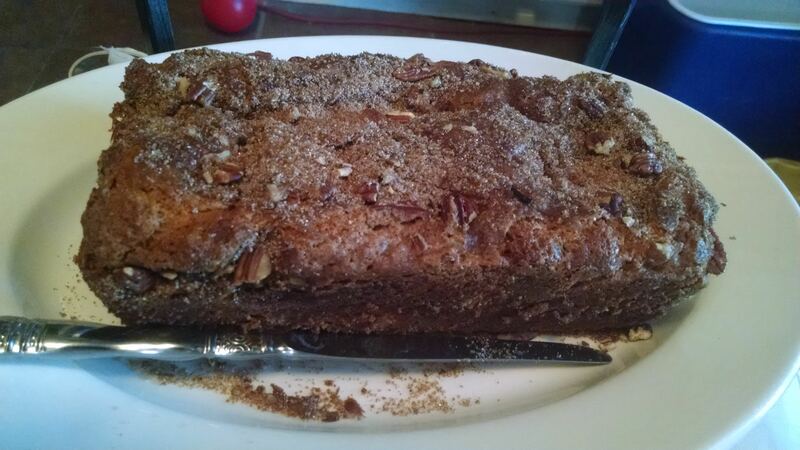 Cinnamon, sugar and pecans make for a tasty treat, especially when baked into this delicious coffee cake. It puts a layer in the center so you get lots of ooyie-gooyie goodness in every bite. Cream sugar and butter. Add eggs, one at a time. Add vanilla and beat well. Add dry ingredients alternately with sour cream. In separate bowl, mix brown sugar, sugar, cinnamon, chopped pecans to form the filling. Mix well. Spread half of batter in a well greased loaf pan (8X5). Top with half of the filling. Spread remainder of batter next then the remainder of filling on top. I confess that many times, I will just use a box of Jiffy Corn Muffin Mix as a short cut for a quick and delicious corn casserole (recipe courtesy of Paula Deen). Tonight, I decided to go a slightly different route. I used corn put up from Michelle’s Grandpa’s farm along with bacon, onion and bell peppers to make one helluva good side dish. In a large skillet, fry bacon until crisp. 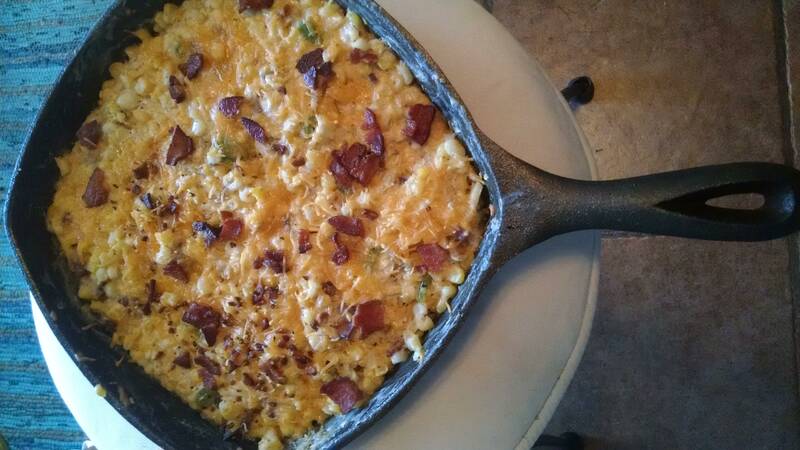 Remove bacon from skillet, crumble and set aside. Reserve 2 tablespoon of drippings, drain off the rest. Sauté onion in drippings until softened and translucent, about 5 minutes. Add garlic and cook until fragrant, about 1 minute more. Add bell pepper, flour and seasonings. Stirring regularly, sauté until the flour taste has cooked off, about 3 to 5 minutes. Remove from heat and stir in sour cream until smooth. Add corn, half of the bacon and about half of the cheese. Mix well. Sprinkle top with remaining cheese and then the bacon. Bake, uncovered, at 350° for 20 minutes or until heated through. Election Night 2016 falls on November 8. That means that evening’s Taco Tuesday offering needs to be able to compete with presidential politics. 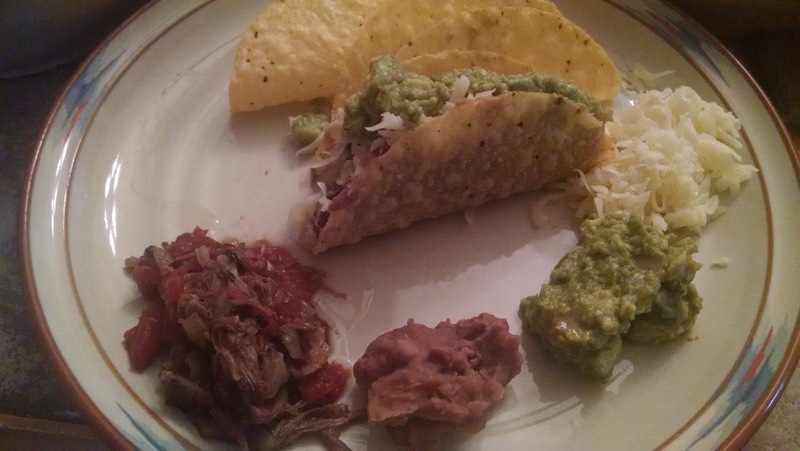 For my returns watch party, I’m going to serve these Shredded Beef Short Rib Tacos done in a slow cooker. I found a recipe on Rick Bayless’ website that I’m using as a jumping off point. After making changes to suit my tastes, I’m quite pleased with the results and I hope you will, too. If the insert of your slow cooker is stove-top safe use it. Otherwise, use a large skillet. Heat the oil in your choosen pan over medium high heat. While the oil heats, salt the beef short ribs. Brown the beef on all sides and then remove to a plate. Reduce the heat and add the onion, stirring regularly. Cook them until soft and golden. This takes about 10 minutes. Add the garlic and sauté until fragrant. Transfer the garlic and onions to the slow cooker. Sprinkle with salt. Lay the short ribs over the onions, bone side down. Quarter the tomatoes and distribute them and the can of Rotel over and around the beef. Drip the Worcestershire around the beef and then sprinkle the remaining spices around the meat. Pour the beer over everything. Cover and turn on the slow cooker to high. The meat will be braised in 5-6 hours. Remove the meat from the cooker and the bones from the meat before shredding it coarsely. Strain out the onions and tomatoes and discard the bay leaves. Taste for seasoning. Mix the tomatoes and onions with the beef and serve with refried beans, guacamole and cheese on soft or hard corn tortillas. I’m a sucker for good bread and focaccia is one of my favorites. I saw this recipe on Serious Eats and thought, no way! I’d rather knead my arms off (or make the KitchenAid do it) than have to wait until the next day for bread! My version works to make a beautiful and delicious loaf that when sliced in half makes awesome sandwiches. Combine 3 1/4 cups flour, salt, rosemary leaves, yeast, 2 tablespoons of olive oil and water in the bowl of a stand mixer fitted with the dough hook. Mix on low speed until no dry flour remains. Increase speed and knead for 10 minutes, adding the other 1/4 cup of flour if the dough is sticking to the sides or bottom of the bowl. Form the dough into a ball tucking the dough underneath itself, rotating it until it forms a tight ball. Place 1 tablespoon of oil in a large bowl and coat the bowl and dough before covering with a towel and setting into a warm place to rise, about 90 minutes. Pour 1 tablespoon olive oil into the bottom of a 12-inch cast iron skillet. Sprinkle the bottom of the pan with corn meal. Transfer dough to skillet and flatten it to cover the entire pan bottom. Cover and let rest for another hour. Drizzle 1 tablespoon of olive oil across top of dough and then distribute the chopped olives. Using your fingertips, pock the top of the entire dough. Sprinkle with coarse sea salt. Place the skillet in the oven and bake until top and bottom golden brown and it is crisp when you lift it with a thin spatula, 16 to 20 minutes. Transfer to a cutting board, allow to cool slightly. Slice and serve. Extra bread should be stored in a brown paper bag at room temperature. I was looking through some old newspapers and I found this one for Rosemary Bread from Chef Paul Prudhomme. It gets its beatiful golden color from the turmeric. I altered it just a little, as I was out of savory and I have a big rosemary bush out front, so I used fresh herbs. Simmer the stock over medium heat until it is reduced to one cup. Let it cool to 110 degrees; then stir in the yeast and sugar. Whisk the eggs in a bowl until they are frothy, and whisk in the salt. Combine the stock mixture and the eggs in the bowl of an electric mixer equipped with a dough hook. Stir briefly to combine; then add the rosemary and turmeric. With the mixer set on slow, gradually add 3-1/4 cups of the flour. Increase the speed to medium and process for 10 minutes. The dough should cling to the dough hook and be fairly elastic. If the dough is soft and sticky, add the remaining 1/4 cup flour. Reduce the speed to medium slow and continue to process 5 more minutes, or until the dough is smooth, very elastic and clinging to the dough hook. Flour your hands well, then gather the dough into a ball. Place the dough in a heavy mixing bowl (a thick porcelain bowl is best) that has been lightly greased with olive oil. Very lightly coat the dough with oil and place the dough in a warm, draft-free place. Cover the bowl with a kitchen towel and let dough rise until doubled in volume, about one hour. Spray a 5-by-8-inch bread pan lightly but evenly with vegetable oil spray. Form the dough into a loaf shape and place it in the prepared pan. Allow to rise for 30 minutes while you preheat the oven to 325 degrees. 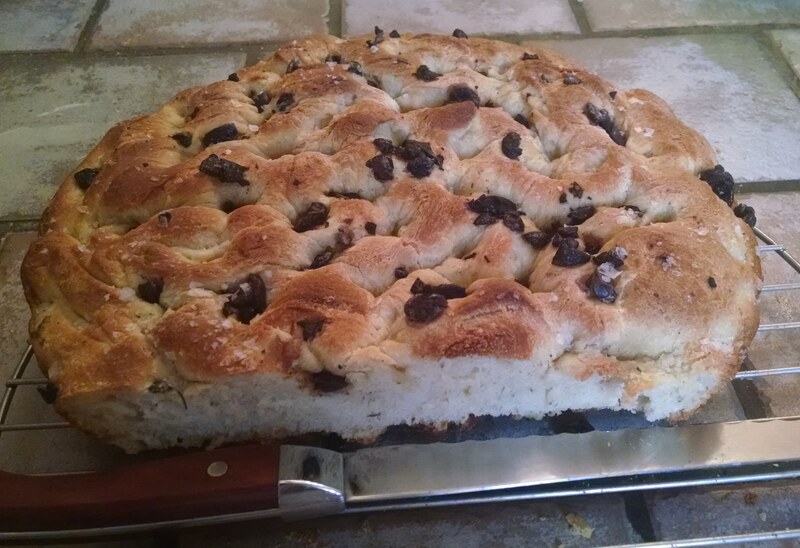 Bake until the top is browned and the loaf sounds hollow when lightly struck, about 40 minutes. Remove from the pan and brush the top with the melted butter. Cool to room temperature on a wire rack before slicing. Wile E Coyote tried many times to catch the Road Runner by putting out piles of boobey-trapped birdseed. The Road Runner always ate and ran before Wille E Coyote’s evil plan could come to fruition. What Mr. Coyote should have done is make these bird seed bars. Worth sticking around to finish, no matter the consequences! Because I am taking these bars with me to the NO/AIDS Walk on Saturday, I pulled out half before adding only one cup of semisweet chocolate to the remaining. The bars are still delicious and will make much less mess on the hands! Toast oats on a large baking tray in a 350 degree F oven for five minutes. Add all the seeds to the tray and mix before baking 5 minutes more. Pour into a large mixing bowl with the dried fruit and set aside. Mix together butter, honey and sugar in a saucepan over medium heat. Stir constantly until it comes to a rolling boil. Stir 2 minutes more. Add in can of sweetened condensed milk and continue to stir until it is mixed well. Add the honey caramel sauce to the seed mixture and stir well. Add in the semi-sweet morsels and then transfer mixture to parchment lined baking tray. Press flat, working fairly quickly as mixture hardens as it cools. Place in the refrigerator for 4 hours. Remove from tray and cut into bars. Store in an airtight container. I have a very large rosemary bush in front of my house that desperately needed pruning. I didn’t want to just throw away the branches, so I decided to use them to add flavor and smoke to a pork loin I’m grilling for Labor Day. I took a few of the newer growth branches and tied them together to make an herby basting brush for the glaze. The rest I spread over the cool side of the grill grates, so they would be under the meat for the final ten minutes or so of cooking. I choose a boneless pork loin and cut my own pork chops, as I can make them thicker than the grocery usually sells them for a lot less cost. I served these chops with grilled sweet potato fries. Combine the brine ingredients in a saucepan over medium low heat with 2 cups of the water. Stir until the salt and honey dissolve. Remove from heat and stir in remaining water and ice. Allow to cool completely. Cut the loin into 1 to 1 1/2 inch thick chops (around six to eight). Cover the pork chops with the cooled brine and put in the refrigerator for one hour. Combine the honey glaze ingredients in a small bowl and stir until well combined. Prepare the grill for two zone cooking by putting the hot charcoal on one side of the grill. Remove the pork chops from the brine and pat dry with paper towels. Let them sit on the counter while the coals get ready. After sprinkling a little salt and pepper on the chops, place them on the hottest part of the grill, directly above the coals. Sear all the chops for about three to four minutes per side, rotating them about 90 degrees after 2 minutes if you want cross hatch grill marks. Once you turn the chops over to cook the other side, baste with honey glaze. When both sides of the chops are seared, move them to the cooler (indirect heat) side of the grate on top of a layer of rosemary branches. Baste again with the glaze. 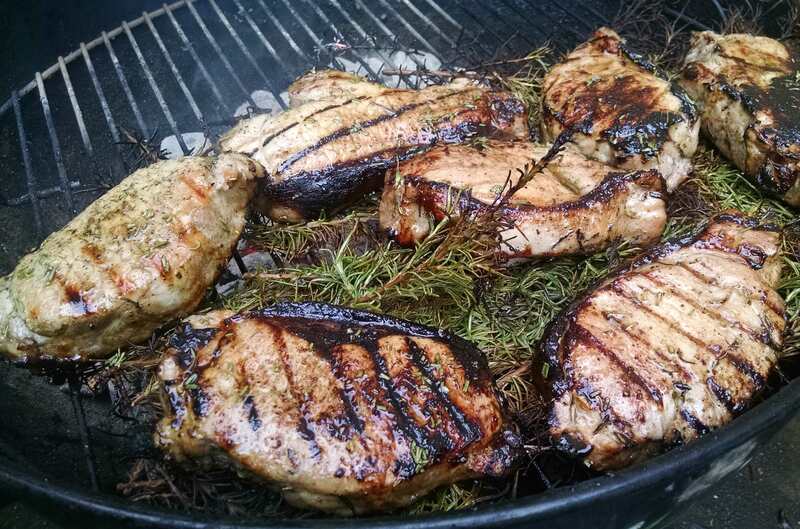 Close the top and allow the fragrant smoke to flavor the chops. After five minutes, flip the chops and baste again. Grill for another 5 minutes. The chops are done when they reach an internal temperature of 140-145 degrees F.
Remove to a serving platter and brush a final time with the honey glaze. Allow the meat to rest for 5 minutes before serving.